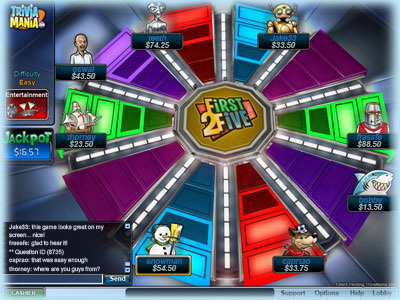 First-2-Five is a fast-paced trivia game that allows you to pit your knowledge against your opponent’s for fun "money". First-2-Five has several different game types available to players based on betting limits ($0.10 to $10 minimum bets). In the next few months, we’ll be adding more ways to play, including a tournament system and game variants based on trivia categories and difficulty. The game begins when a player sits down at a table. You may bring a maximum of 50 times the minimum bet to the table. For example, you sit down with a maximum of $50 when you join a $1 game. After sitting down you start the game by putting an “ante” into the Jackpot. The ante is a fixed entry fee that all players pay. It is equal to the minimum bet (so $1 at a $1 table). A player that does not ante “sits out” and may not participate in the game. During a Question Round, you answer 1 multiple-choice question. Each player gets the same question and has 15 seconds to select an answer. After everyone has answered, you find out if you got the question right or wrong and then move to the next question in the round. At the completion of each Question Round, there is a Ante Round for the next question. During the Ante Round, you may Play (ante), or Pass. Once all players have played or passed, the Ante Round ends. At a $1 table, ante is $1 of the player is in the lead. At a $1 table, if the player is 1 question behind the leader the ante is $0.50 (half of the full ante amount). At a $1 table, if the player is 2-3 question behind the leader) the ante is $0.10 (1/10th of the full ante amount). During the Ante Round, players will see a section their play area lit up for each correct answer given. A player whose board section is lit up with a golden border is attempting to correctly answer their fifth question, and win the game. The game ends immediately when a player has answered 5 questions correctly and the winner is paid the Jackpot. The game will also end automatically after 10 questions, and the player with the most correct answers is the winner. If more than one player gets the same number of correct answers, they “split the pot” evenly. TriviaMania.com charges a 15% rake for each game played. � Ready to play? Click here to download.